Connor McDavid, who's predicted by many to be a Wayne Gretzky-caliber player, is shown in the above video during the 2015 NHL Team Draft Lottery (18 April 2015). Although the respective teams will not announce their player choices' until 26-27 June, a lot of people have speculated that the young hockey phenom does not what to play for the Edmonton Oilers - the team who drew first choice. 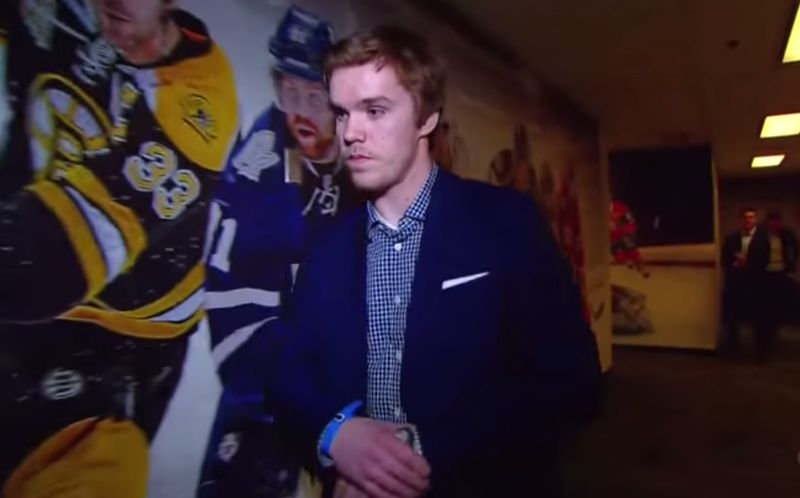 What follows is a partial body language analysis of Connor McDavid. 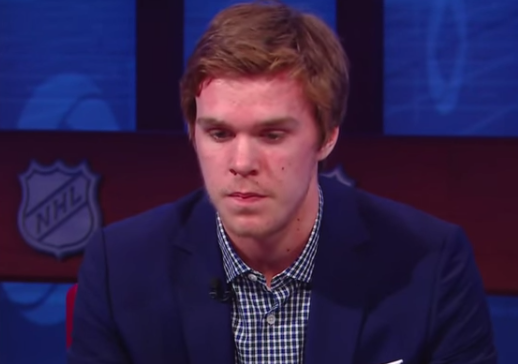 McDavid is shown here just after the 2015 NHL team draft order was announced. He knows now that he'll probably be picked by the Edmonton Oilers. His Loose Forward Lip Purse (5:05) (as opposed to a tight lip purse or a lateral lip purse) shown here indicates his clandestine disagreement and/or his clandestine plan. This nonverbal tells us that he knows he must not voice his true feelings aloud - which, particularly for being only 18 years old, we will see momentarily - he does a fairly good job (yet not a perfect one). It's helpful to think of this expression as, "I'm not going to show (or tell) all my cards (plan)" or "I'm going to make them think one thing, but not my true feelings/plan." His very prolonged false watch adjust is a very common anxiety tell, but more specifically this nonverbal MAP surrogate (Manipulator, Adaptor, Pacifier) tells us that although he's certainly a dominant personality - McDavid is trying to call-forth more alpha qualities for his upcoming TV interview. This is one of many alpha up-regulating nonverbal tells. After he realizes another man who was accompanying him is no longer by his side, Connor McDavid takes in a moderately deep breath and reaches for his heart (5:18). He's being pushed out of the nest. He's nervous (no surprise). At 6:59 we see McDavid's loose forward lip purse repeated as he again is feeling strong disagreement (and he's brainstorming a way out of the Oilers) - but when this expression is made, such disagreement is rarely voiced aloud. The loose forward lip purse nonverbal is always made by a person who believes they are the alpha relative with who(m) their interacting - AND they believe they have a good chance of success in implementing and executing their plan(s). 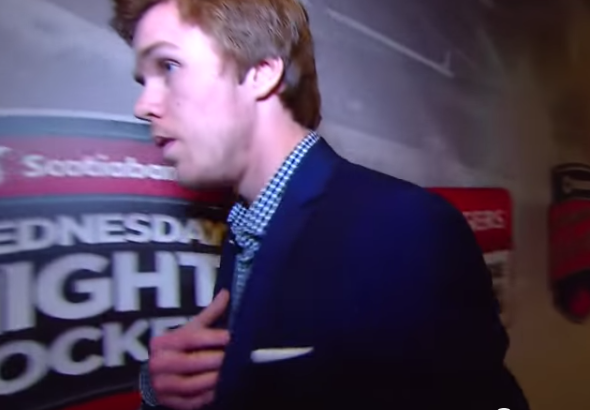 Few of us would be able to handle ourselves on TV as Connor McDavid did - yet he had multiple other tells (nonverbal, verbal and with respect to his paralanguage) which betrayed his true thought-emotions (What others did you note?). Considering the millions on the line in professional sports, players (particularly rookies) would be wise to be coached in preparation for such camera appearances, lest they lose tactical contract negotiation strength, salary, bonuses and endorsements.